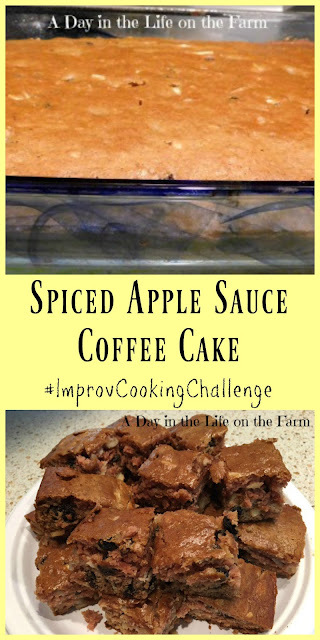 Our friend and brainchild behind Improv Cooking Challenge, Nichole of Cookaholic Wife, chose Sugar and Spice as the theme for this month. Nichole assigns all of us 2 ingredients each month that have endless possibilities and then we create the best recipe we can containing those ingredients. It is not only a lot of fun but it is a great way to get some new recipes for our repertoire. During the last week of September, I participated in a great annual event known as #AppleWeek. As the name implies, a group of bloggers spend one whole week create recipes in which the star ingredient is apples. One of the recipes I shared during that week was my Easiest Ever Apple Sauce. That apple sauce is the basis for this delicious coffee cake that I am sharing with you today. You don't have to make your own applesauce but once you see how easy my recipe is, I think you will want to. The applesauce keeps this coffeecake moist and flavorful. 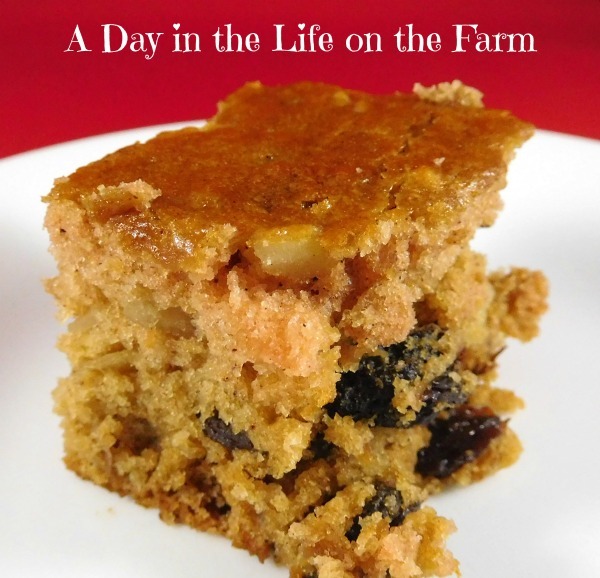 The addition of raisins and almond gives the cake depth and texture. I love making coffee cakes because I am not a frosting lover. When making a coffee cake the entire focus is on the cake itself. Sometimes, I might add a little glaze but most of the time I try to make the cake so wonderfully complex that no embellishments are needed. I was very successful in that endeavor with this cake. 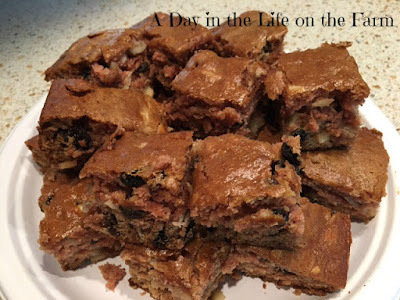 This cake is perfect for breakfast in the morning or for packing in a lunchbox. It makes a great after school or work snack and is wonderful as dessert with a dollop of whipped cream. Enjoy. In large bowl of stand mixer, fitted with paddle attachment, cream together the sugar, coconut oil and egg. Add the flour, baking soda, salt and cinnamon. Set speed to low and mix until just combined. 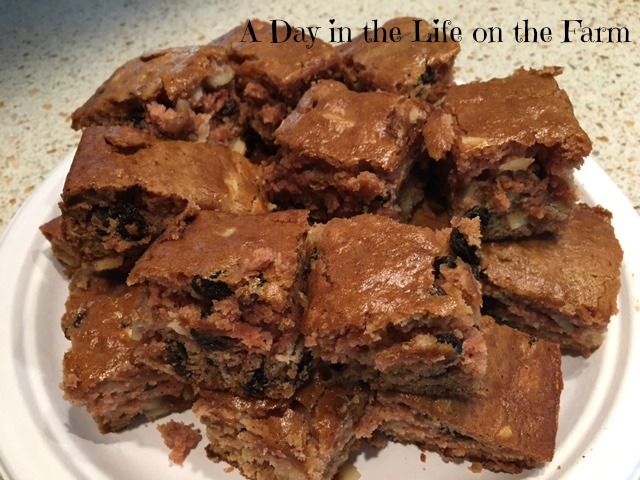 Stir in the applesauce, raisins and almonds. Although, she used walnuts & I'd much prefer the sliced almonds you stuck in there, Wendy. mmmmmmmmmmmmmmm! Ohhh Wendy! I have a big batch of homemade applesauce in my fridge right now - this is hollering at me! I am a lover of the frosting. I can eat frosting without the cake. But I do love coffeecake and yours looks so good! I give all my frosting to Frank....he, too, is a frosting lover Paula. Coffee cake is my favorite kind of cake...followed by ice cream cake. I'm not a frosting person either. I don't mind a glaze once in a while but frosting usually gets scraped off and given to my husband. This is such comfort food. I used to make applesauce cake every year when the apples started coming in, like clockwork. You know being a blogger, we get to cook so many things that often there isn't time for every single thing, but I am glad you got to squeeze this one in. This is fabulous and I cannot wait to make it! Thanks for a terrific recipe! !